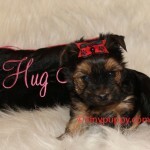 Our little Parti Carrier Yorkshire Terrier Hugs is one special little boy. He is a little on the mellow side and loves people. Hugs loves to play with toys and loves to be cuddled. 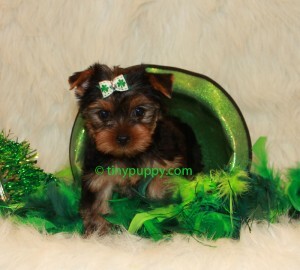 He has a dark black and tan coat that I believe will stay black and tan. Hugs is just 1.8 lbs at 9 weeks of age. 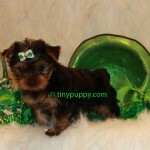 His Mom is 1/2 parti, 1/2 Black and Tan. 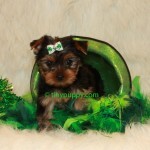 His Dad is full a AKC Black and Tan Yorkie. There were two in the litter. 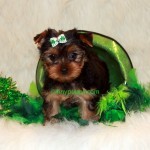 His sister Kisses was a full parti Yorkshire Terrier. 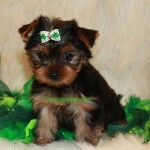 He is ready now to come be your special baby. He’s a cutie pie.